The origins of armored bridge laying vehicles can be traced back to the First World War, when fascines (bundles of wood) were used by Allied tanks to be able to cross trenches and German anti-tank ditches. After the war, the idea of trench crossing systems based on tank chassis settled and the Soviets started to develop such vehicles which led, for example, to the CT-26 (ST-26), a bridge-laying tank based upon the T-26 light tank. 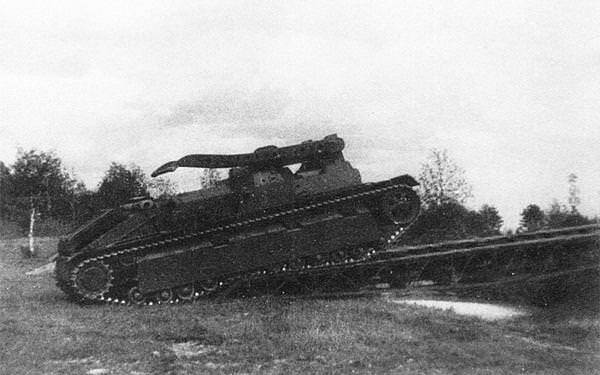 When the T-28 medium tank was taken into production in 1933, it also proved to be a valuable base to test new designs and technologies, like mine crawlers, but also bridge tanks, one of them being the ИТ-28 (Инженерный Танк: Engineering Tank IT-28). The development of the IT-28 was started in 1936 by the Научном авто-тракторном институте (abbreviated НАТИ, NATI: Scientific Auto-Tractor Institute). Work went slowly and it was 4 years later, in March 1940, that the tank could be equipped with the prototype bridging system. Only one T-28, carrying serial number 1638, was assigned to be converted. The conversion took place at the Kirov factory No. 100 located in Leningrad. The main and the two secondary turrets were replaced by an armored superstructure. After completion, it was sent to the testing range and designated IT-1. The space freed by the removal of the two secondary turrets was used to enlarge the crew compartment. However, two machine guns were fitted in ball mounts in the hull, roughly on the same place as the original turrets. On top of the enlarged hull, two extensions were placed to which two arms were attached. The bridge was carried, raised, and lowered by these two arms. These arms could be turned backward in case the bridge was not attached. To do so, a power transmitter was placed between the engine and the arms. The two-track bridge had a length of 13.3 meters. Both tracks were attached together by steel beams and had a total width of 3.5 meters. The weight of both chassis and bridge combined was 29 metric tonnes which was one tonne heavier than a serial production T-28. The main turret was replaced by an armored eight-sided superstructure and two winches were placed on top. The winches were attached to the back of the bridge via a pulley located near the arms. With these winches, the bridge could be pulled forward. After that, the arms could be pointed to the ground and, by loosening the winches, gravity pulled the bridge to the ground until the last bar rested on the slight slopes on the arms. At this point, the winches had to be detached by the crew. Then, the arms could be lowered more, the bridge would lay on the ground and the vehicle could drive backward removing the hooks from under the bridge. After that, the arms were turned backward to ease travel. Picking up the bridge was a bit more difficult to perform. Although it was basically the reverse system, the winches could not pull the bridge further than the position of the pulleys. When the bridge reached that point, the arms were slightly raised, so the bridge could slide down by the force of gravity, while the winches would be slowly loosened again. The first trials took place during June 1940, on the NIBT proving grounds in Kubinka. These trials showed that it took between three to five minutes to lay the bridge. The bridge itself could sustain loads up to fifty tonnes. However, several major flaws were encountered, like how the bridge had to be picked up as mentioned earlier, but also the fact that some of the crew had to get out of the vehicle to attach and detach the winches, becoming very vulnerable to enemy fire. Despite these flaws, the general results were relatively good, but the T-28 medium tank was planned to be taken out of production, so the project was canceled. However, the system and idea of the bridge laying tank lived on. It was planned at one point to mount the system upon a KV chassis, but this idea was never realised. The only IT-28 prototype was not scrapped and kept at the testing range. During early October 1941, several vehicles from the testing range including the IT-28 were assigned to two armored companies, Semenov and Maksimenko, which were named after their commanders. Additional vehicles were urgently needed and the IT-28 was assigned to the company Maksimenko on the 8th of October. Some paperwork stated that the vehicle was armed with two DT machineguns. In red ink, ‘Kazan’ was written on the form too, which might mean that the IT-28 had to be sent to the city of Kazan, but in reality all traces of the vehicle were lost after it was assigned to the company. It is very likely that the vehicle was either captured and possibly used by the Germans or reclaimed by either side. Its fate is unknown. Beside the IT-28, several other vehicles were produced and tested. In 1936, the ДМТ-28 (DMT-28, with DM probably meaning деревянный мост, wooden bridge) was created. 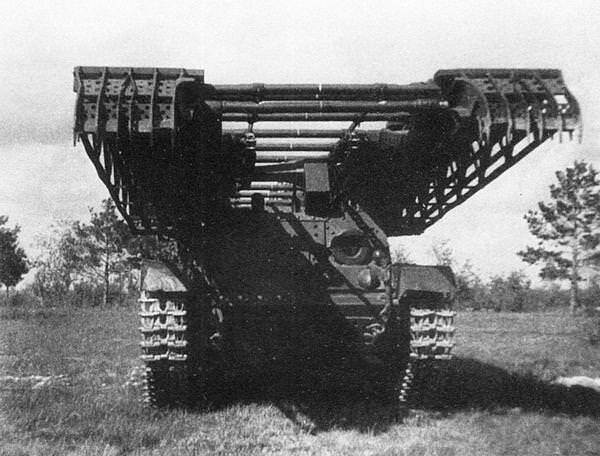 As the name suggests, it was basically a wooden bridge mounted on the T-28 chassis. The bridge could overcome ditches with a width of six meters and 2.3 meters wide eskers, ridges of stratified sand or gravel. Trials proved to be unsatisfying and further development was discontinued. In the early months of 1940, another attempt was made to design a system to overcome ditches. It consisted of a metal bridge rigidly attached to a T-28 chassis with a removed main turret. This was done at the Kirov plant and specifically designed to overcome the anti-tank ditches of the Finnish Mannerheim Line. The philosophy was simple, just drive the tank into the ditch so other vehicles can cross over it. The idea is similar to that of the British Churchill ARK. One vehicle was converted, but the trials showed that the design was highly inefficient and the project was canceled. This may be to do with the end of the Winter War on the 13th of March 1940. During 1939, a T-28 tank was equipped with wooden fascines. Trials showed that, with help of these fascines, trenches with a width up to six meters and a depth up to 2 meters could be crossed. The vehicle was called ДФТ-28 (DFT-28 with DF probably meaning деревянная фасция, wooden fascines). This project was discontinued as well. No photographs of this tank or its trials are known yet. Although the IT-28 was original and worked relatively well, some major issues still had to be resolved, beside, the chassis was already obsolete in 1940-41. Maybe the most successful part of this project was the sustainability of the bridge itself, which could sustain every Soviet tank that was taken into serial production, not only at the time of construction, but also later tanks like the majority of the IS tanks. The IT-28 never went into production, but its legacy lived forth after World War II, with the MTU-12 ABVL based upon the T-54 tank chassis and resembling the IT-28 system. 1941 Tanks in the Battle Of Moscow, Maksim Kolomiets. “Frontovaya Illyustratsiya” issue No. 4-2000, RKK T-28 and T-28 Multi-turreted Tanks, Maksim Kolomiets.